I was looking for a new recipe for roasted red potatoes and I couldn't be more pleased with this one. I used about a tablespoon of oil to coat the baking pan. I chopped the potatoes (husband's personal preference) and simply mixed with the cheese and spices, and spread onto baking pan. Per the instructions, I roasted for 20 minutes, stirred them and continued roasting for additional 20 minutes. They were absolutely delicious and we all (4) enjoyed them! This was an easy, enjoyable recipe that I will be making again! Preheat the oven to 400 degrees F. Generously butter an 8x10-inch casserole dish. Peel and cut the potatoes in half lengthwise then lay each half flat and slice lengthwise into ½-inch wide half moons. 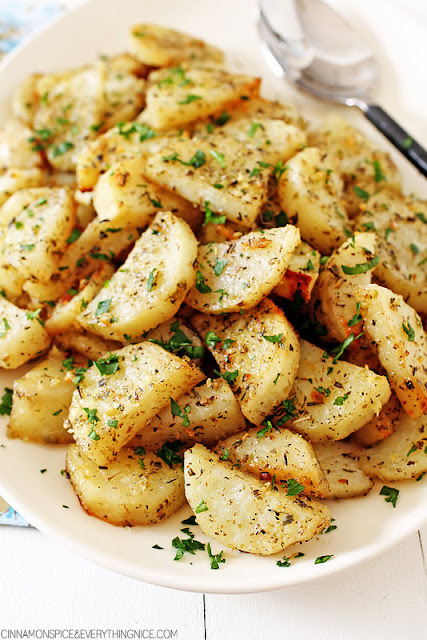 Place the potatoes in a big mixing bowl and toss with 2 tablespoons of oil. Toss with the seasoning, garlic, 1 teaspoon salt, ½ teaspoon black pepper and half the Parmesan (plus a few pinches of red pepper flakes if you like). Pour into the casserole dish and scoop out any spices or garlic left in the bowl. Sprinkle a tablespoon of Parmesan over the top and drizzle with a tablespoon of oil. Bake 30 minutes then remove from the oven and toss well. Sprinkle the remaining Parmesan on top and drizzle with the remaining oil. Bake 25 more minutes. Toss well and season to taste with more salt and pepper if needed. Place them in a serving dish and pour any remaining oil at the bottom of the pan over them and garnish with a little fresh parsley.